This Hubble Space Telescope image of the Trifid Nebula reveals a stellar nursery being torn apart by radiation from a nearby, massive star. The picture also provides a peek at embryonic stars forming within an ill-fated cloud of dust and gas, which is destined to be eaten away by the glare from the massive neighbor. This stellar activity is a beautiful example of how the life cycles of stars like our Sun is intimately connected with their more powerful siblings. The Hubble image shows a small part of a dense cloud of dust and gas, a stellar nursery full of embryonic stars. 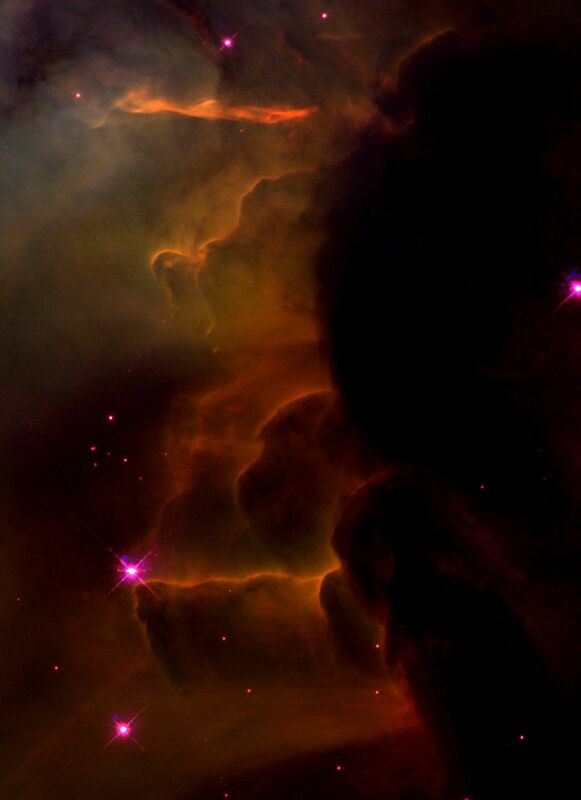 This cloud is about 8 light-years away from the nebula's central star, which is beyond the top of this picture. Located about 9,000 light-years from Earth, the Trifid resides in the constellation Sagittarius. A stellar jet [the thin, wispy object pointing to the upper left] protrudes from the head of a dense cloud and extends three-quarters of a light-year into the nebula. The jet's source is a very young stellar object that lies buried within the cloud. Jets such as this are the exhaust gases of star formation. Radiation from the massive star at the center of the nebula is making the gas in the jet glow, just as it causes the rest of the nebula to glow. The jet in the Trifid is a "ticker tape," telling the history of one particular young stellar object that is continuing to grow as its gravity draws in gas from its surroundings. But this particular ticker tape will not run for much longer. 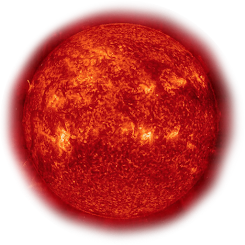 Within the next 10,000 years the glare from the central, massive star will continue to erode the nebula, overrunning the forming star, and bringing its growth to an abrupt and possibly premature end. Another nearby star may have already faced this fate. The Hubble picture shows a "stalk" [the finger-like object] pointing from the head of the dense cloud directly toward the star that powers the Trifid. This stalk is a prominent example of the evaporating gaseous globules, or "EGGs," that were seen previously in the Eagle Nebula, another star-forming region photographed by Hubble. The stalk has survived because at its tip there is a knot of gas that is dense enough to resist being eaten away by the powerful radiation. Reflected starlight at the tip of the EGG may be due to light from the Trifid's central star, or from a young stellar object buried within the EGG. 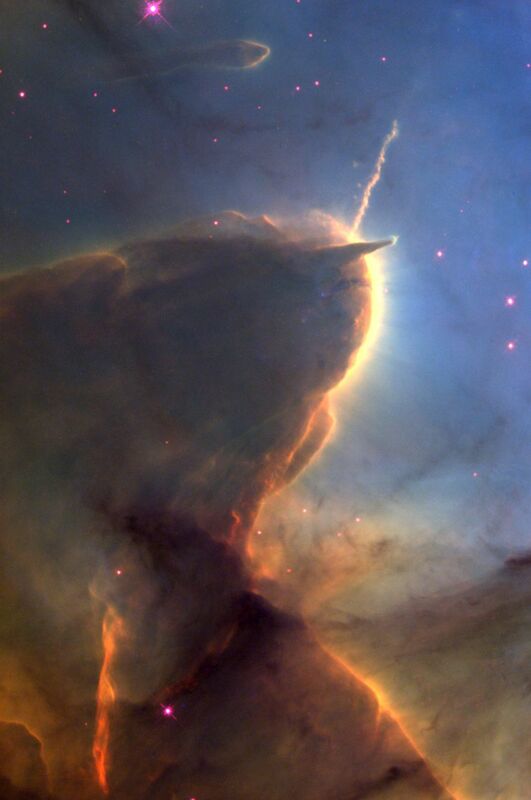 Similarly, a tiny spike of emission pointing outward from the EGG looks like a small stellar jet. Hubble astronomers are tentatively interpreting this jet as the last gasp from a star that was cut off from its supply lines 100,000 years ago.